Our Facebook inbox is a treasure trove of inspiring reader makeovers and homes built with a minimal budget. 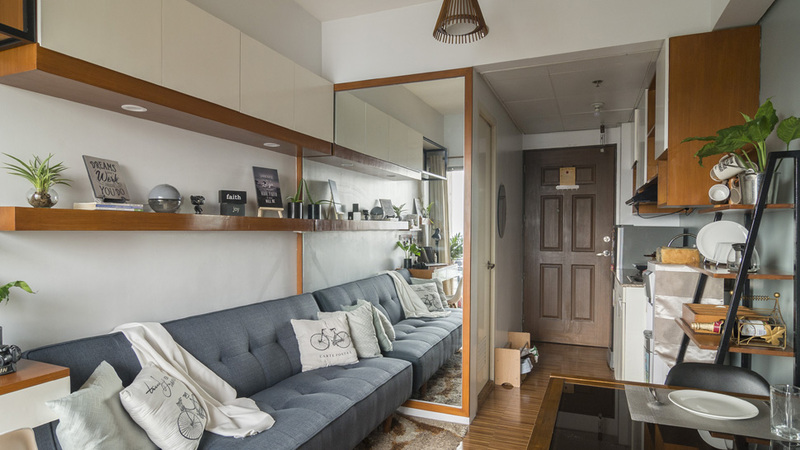 This studio unit in Quezon City stands out because it’s not only designed with a tight budget, a talented student from the University of the East was behind it, too. “This project was used for my thesis subject, FIN 419, which required us to look for a client who wants to renovate 90% of their home. My brother volunteered to be my client. After reviewing the final output, one of the judges approached me and asked me if I want to send my project to Real Living. At first, hindi ko sure kasi akala ko hindi matatanggap kasi student palang ako. My parents convinced me and told me that it’s a chance to showcase my work,” shares Arvin Ramos. Arvin’s brother’s studio unit measures 20sqm and this limited area is challenging to work with. Since the owner is busy overseeing his businesses, he doesn’t have the luxury of time to visit parks to be able to unwind and relax. To address this, Arvin opted for an open layout to make the unit airy and spacious. “[I also] brought the outdoor atmosphere indoors by using natural shades of wood, displaying indoor plants, and working with exposed metals. A splash of green makes it calming as well,” he explains. Since he incorporated existing furniture pieces into the final look, he only spent around P76, 000 to give the studio a new look. Sourcing and shopping at Dangwa, Quezon City Circle, and different stores helped him achieve his vision for the space while staying within the budget.